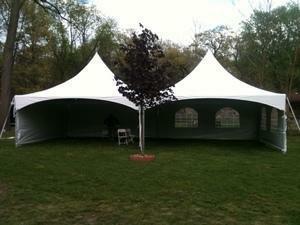 Our 20' x 40' High Peak Frame Tent will seat up to 96 people. It is set up by joining two 20' x 20' high peak tents with a gutter between the two tents to keep rain from entering. Our pricing includes set-up on the day of your rental (or the previous day, depending on our delivery schedule) and pick-up on the day following your party (or the evening of your party--after the party is over). No additional charge for an overnight rental. The tent is pictured with sidewalls attached on 3 sides. Sidewalls are not included in the 20x40 tent pricing but are available at an additional charge. Please note that we do not set up on gravel, asphalt, dirt, or concrete (grass set ups only).